Digital audio facilities often require a number of clock sources, which are used to synchronise outboard processors to the system clock rate using external clock inputs. 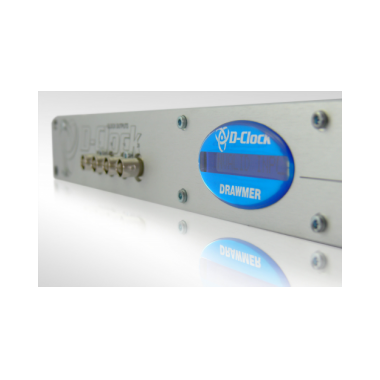 The Drawmer D-CLock is a dual input, twenty output word clock distributor with a 16 character blue LCD display providing a high accuracy reference measurement of the incoming sample rate. It uses a high stability TCXO (temperature compensated xtal oscillator) along with a microcontroller to measure the incoming sample rate to an accuracy of 2ppm and displays the information in three different formats, actual frequency (to one decimal place), nominal frequency +/- ppm error, or nominal frequency plus percentage of pull up or pull down. 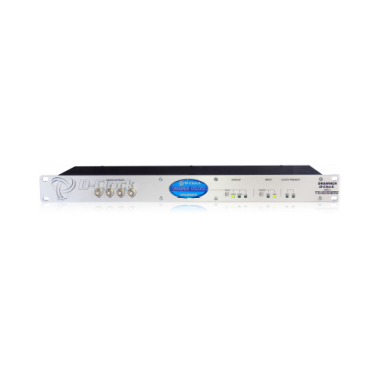 It has both AES/EBU and BNC word clock inputs featuring a zero latency loopthrough output with switchable high impedance to maintain the correct level of the digital signal for onward distribution. 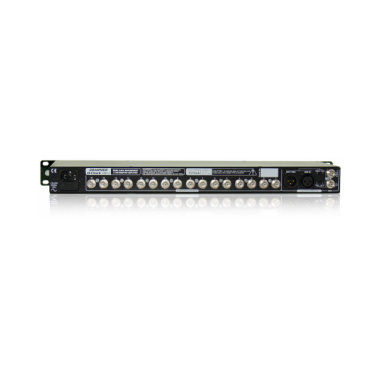 Sixteen BNC clock outputs are situated on the rear panel with a further four BNC clock outputs on the front panel for quick patching to other digital devices. 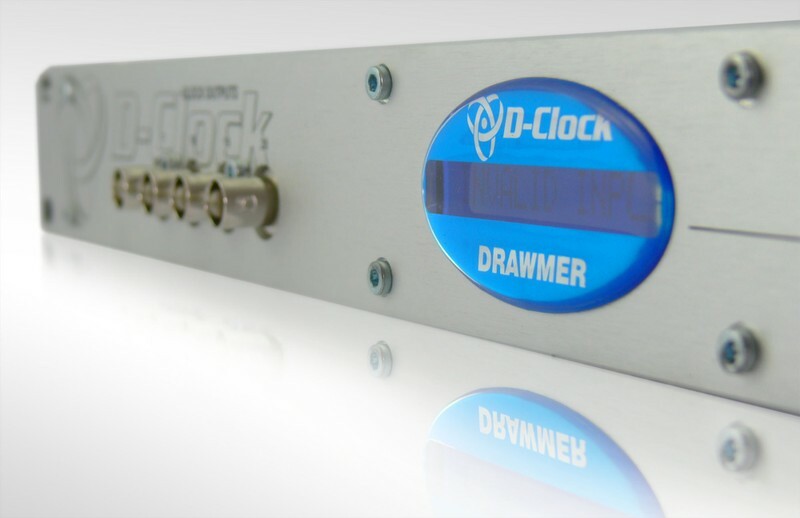 The wordclock outputs can be fed from the wordclock input at any sample rate between 32KHz and 768KHz or derived from an AES11 input or stripped from an AES3 audio signal at any sample rate between 32KHz and 192KHz. 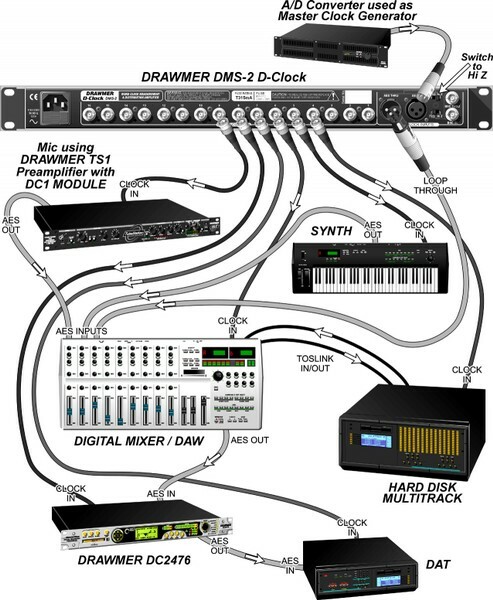 Using an audio signal to provide the clock means even products without a wordclock output, such as some analogue to digital converters, or one of the many mic pre-amplifiers with internal A/D conversion but no word clock output, can be the master wordclock source for the whole digital studio. You may not realise it but you have been listening to Drawmer for the last 30 years, almost every time you turn on the radio, watch t.v. or go to a gig. Since the introduction of the DS201 noise gate in 1982 Drawmer products have consistently remained the unequivocal choice of producers, engineers and artist’s, and, as such, have been installed in almost every major recording studio, live venue and broadcast facility throughout the world. Drawmer products are the engineer’s indispensable tools that elevates good sound into truly stunning! The company, which is based in Yorkshire, England, was founded by Ivor Drawmer, whose passion was designing audio circuits. "The whole thing started in 1981," explains Drawmer. "I had been playing keyboards with bands in Yorkshire, but that wasn't going so well and also I wasn't getting any younger. With the encouragement of friends I built a small batch of stereo delay lines, which I called the Multitracker, and that was the start of Drawmer." In 1982 Drawmer revolutionised gating by introducing the DS201 Dual Noise Gate, the world's first 'frequency conscious' noise gate. "It came about from working with a producer called Phil Chapman, who wanted me to build him a gate. Without doing any research I built this thing that switched on, held for a certain amount of time and then just switched off. In practice of course it was no good at all, so I then spent some time going around studios looking at how gates were being used. What really surprised me was how long engineers spent fiddling with gates trying to get them optimally set up and I realised very quickly that a better design was needed." The DS201's unique High-Pass and Low-Pass key filters, comprehensive envelope control and ultra-fast attack time has since made it the 'industry standard' gate throughout the world. 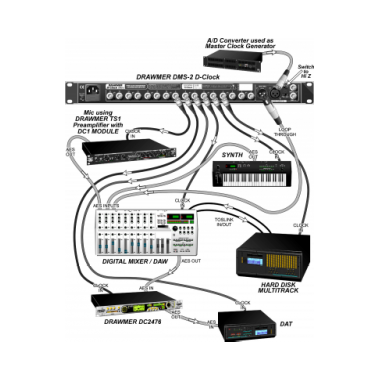 The 201 transformed the gate from what had previously been a simple "on/off" device to a powerful creative tool playing a significant role in modern music production. "It was the kind of unit that people discovered uses for and it immediately enabled engineers to do the things they'd always dreamed of with minimum fuss," says Drawmer. Very little has changed to the design of the DS201 over the years, and Ivor Drawmer claims it sells as well now as it did back in the early 1980s. "It's astounding where they all go, but to date we've sold tens of thousands of units," he says.